According to UN, women's participation in the ICT is less than 30% in the sector globally, but the situation in South Africa is far worse. A major concern is that young women are not receiving the support or encouragement needed to enter the sector: the 2017 Global Gender Gap Report states that only 13% of SA graduates in the Stem (science, technology, engineering and mathematics) fields are women. The MTN Women in ICT – Partnership for Change Awards, aims to tackle this issue and redress the gender imbalance, by showcasing the achievements of women in the sector and identifying new role models. “We believe that gender diversity is crucial to growth in the ICT sector, and we are committed to helping drive change. Young women, and those already in the profession, need strong mentors to inspire them, and importantly also to add their unique perspectives to the development of products. Without this perspective, future design and innovation will simply not be able to talk to the broader market out there, of which women are a key component,” says Jacqui O’Sullivan, executive for corporate affairs at MTN South Africa. 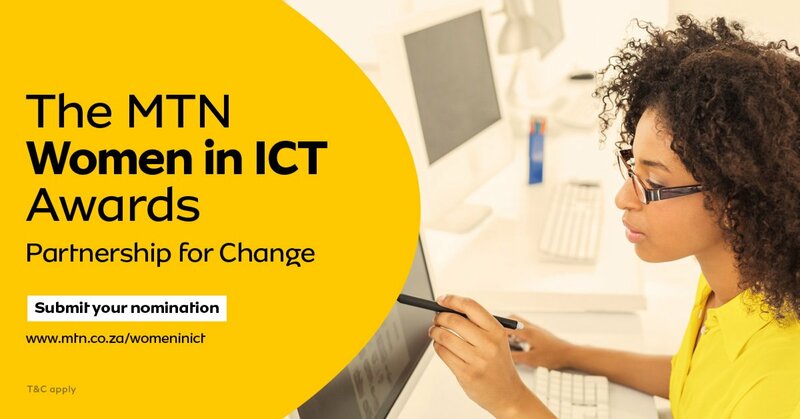 Since its launch, in 2015, the The MTN Women in ICT – Partnership for Change Awards, have showcased women in technology in South Africa. This year the awards series will again acts as a platform to support the industry in its mission to move the dial on gender. Recognises senior female executives in the ICT sector whose proven depth of experience in leading change, influencing business outcomes and leading teams has impacted positively on the organisations they lead. Recognises women that have introduced new methods, ideas, or products that are contributing in one way or the other to the delivery of a bold, new, digital world. Recognises wholly-owned women-run enterprises that are viable businesses which are making inroads in the ICT sector and will be extended to internal employees who also run businesses on the side, using ICT to enable their businesses. Recognises a top ICT graduate from a tertiary institution who finished top of their class. The award is open to females who graduated in the immediate year preceding the awards ceremony. Recognises a woman who has made a considerable difference in her community through ICT or use of an ICT tool to make a difference in the community. Recognises a journalist who has contributed immensely to creating a better understanding of the ICT industry through their reporting. this category seeks to recognise a journalist who has contributed immensely to creating a better understanding of the ICT industry through her reporting. This gives the public an opportunity to vote for the female candidate they wish to recognise using our platform. This award recognises an employees that have made a difference within the organisation with the use of ICT and Technology. Seasoned and accomplished professionals will oversee the adjudication process. These professionals comprise of captains of industry, renowned entrepreneurs, leading figures in the ICT sector and public servants. The winners will be announced at an event which will be taking place in Johannesburg. For more about the awards or if you want to ente, click here.